Il cottage Toddy Pond Farm è un luogo caldo e accogliente ricco di storia e bellezza naturale. Situato su un'azienda agricola di circa 500 ettari, il cottage si affaccia sul Toddy Pond e sulle montagne. Godetevi queste vedute e quelle della fattoria dal portico anteriore schermato, oppure scegliete i mirtilli dal patio posteriore e ascoltate i gufi la sera. All'interno, il cottage ha una cucina completa, 2 bagni, lavanderia completa e 3 camere da letto e angolo notte; la camera da letto matrimoniale con un nuovo letto matrimoniale al piano di sotto e al piano superiore l'accogliente angolo cottura full size con tende per la privacy, la camera con letto a due piazze con letto matrimoniale e camera doppia con due letti singoli. In totale, la casa può ospitare comodamente fino a 7 persone. Il cottage stesso risale molti anni - assicuratevi di leggere le pareti originali con i messaggi scritti a mano da ogni visitatore. Nella zona soggiorno / sala da pranzo c'è tavolo per 6 posti e un divano e sedie vicino alla stufa a legna. Non c'è televisione nel cottage, ma wifi è disponibile. I confortevoli sedi delle finestre sono state conosciute per catturare un lettore pigro del pomeriggio in un sollievo beato in più di un'occasione. All'esterno del cottage, sentitevi liberi di esplorare i boschi su numerosi sentieri escursionistici privati ​​o visitare gli animali della fattoria Toddy Pond Farm; una fattoria di allevamento con pecore, capre, mucche, maiali e polli. Sentitevi liberi di fermarsi alla pasticceria di mattina per vedere come è stata fatta la mungitura o venire a guardare mentre abbiamo messo gli animali a pascolare per il giorno. C'è un negozio di fattoria dove è possibile acquistare formaggi, yogurt, kefir e verdure fermentate - tutti fatti proprio qui in azienda nella nostra agenzia concessionaria del Maine. Vendiamo anche i nostri pascoli e boscaiole allevate - carne di maiale, pollo, manzo e agnello. E stagionalmente offriamo miele dalle nostre api. Se il nuoto, la nautica o la pesca sono quello che ti piace, fare una passeggiata attraverso i boschi fino a Toddy Pond e godersi l'atterraggio privato completo di zattera, quattro kayak e una canoa. Oltre 1 miglio di facciata privata sul laghetto garantisce la totale privacy e la tranquillità, anche se probabilmente sentirete i buchi fuori sull'acqua. Godetevi viste supplementari sulla Pond View Trail completa di 2 ponti mentre si cammina lungo Toddy Pond in un ciclo indietro fino al cottage. Se stai cercando un posto per allontanarsi da tutto senza dover guidare per miglia e miglia nel deserto, allora Toddy Pond Farm è il posto per voi. Durante la vostra visita potrete vedere e sentire la fauna selvatica e tutte le altre attrazioni e suoni della natura e ancora la meravigliosa città balneare Belfast è a soli 15 minuti di distanza con le sue gallerie d'arte, negozi di prodotti alimentari naturali e numerose opzioni di ristorazione eclettica. È davvero il meglio di entrambi i mondi qui. Toddy Pond Farm è stato descritto in un articolo di Boston Globe sui soggiorni di fattorie qui negli Stati Uniti, e più recentemente in un articolo di marzo 2017 Magazine genitore TPF è stato selezionato come la fattoria soggiorno a visitare a Maine. Speriamo che tu decidi di venire a stare con noi. Toddy Pond Farm è una latteria licenza Maine con un negozio di fattoria in loco portando una varietà di prodotti agricoli di stagione in vendita tra cui: latte crudo, yogurt, kefir, formaggi, gelati, burro, miele, biologico-pascolo sollevato pollo, maiale, e agnello. Even better than the pictures show. We are so grateful that we were able to stay here and experience this amazing land, the fields, pine trees, pond and animals. This is a beautiful clean farm that smells better than fresh mown grass. Is it hay? Wildflowers? I'm not sure but it is sweet and fresh. We heard that it was brutally hot back in Boston while we were sitting in Adirondack chairs, under the pine trees by the edge of the lake, enjoying the fresh breeze while the kids were jumping off the dock and playing with Shep the border collie, or the goats that they walked down to the lake. We kayaked and swam and explored the little islands. I thought there were going to be all kind of rules, but the farmers are so easy going. Our twins who turned 13 while there, loved it. Loved hanging out with the cows, watching the milking, feeding the pigs, collecting the eggs. We are already planning to go back next year. The house is even better in person. Spotlessly clean and fresh. Bedrooms and bathrooms are great. The "nook" is the best bedroom in the house, a curtained off mattress sized cupboard with an amazing view. But all the bedrooms have great views and are so comfortable. One day we drove the 15 minutes to Belfast but we regretted it. Belfast is a beautiful little city, worth a visit in it own right, but we just wanted to be back on the farm. It is such a rare place, where we were on all this gorgeous land to ourselves with only the farmers and animals there. Thank you so much to Heidi and Greg who make this very special place what it is and make it available for others to have this experience. Teena, Greg, and kiddos! Thank you for your kind words. We so appreciated your family’s interest and and engagement with the farm and land we love. You were lovely guests, we’ll certainly look forward to seeing you again! Fourth straight year at Toddy Pond! This was our fourth trip to the cottage and we loved it just as much this year as we have every other summer. We spent almost all of our time at the pond and only stopped by to see the animals a little bit. Baby cows, baby goats, all cute. Enormous pigs who come running when they see anyone. At this point, the kids are older and they want to be active with hiking and kayaking and swimming until they drop, which is great. And we still love the quiet evenings on the porch and the early morning rooster calls. We hope to be back many more years. Wonderful to have you stay with us again - so glad you guys had a good time and such good weather too! Thank you for taking such good care of the cottage and for truly appreciating this place. Hope to see you all again next summer!! Third year at the cottage! My adult sons and girlfriend, my sister, my beau, and I spent a perfect week at the Toddy Pond Farm guest house. The beds are firm and comfortable, the rooms clean and of the right number. Two full bathrooms ease the crowd crunch. The kitchen is well equipped, with a gas grill in the patio. The large gathering/dining room couldn't be better and is equipped with cards and games; several of us napped on the day beds at various times. The pond down the hill was clear, quiet, and beautiful, with a swimming dock, and kayaks available to paddle out to the loons. We easily drove into Belfast for restaurants and history when we wanted, and gladly stayed at the house for games, reading, swimming, and more. Our friendly and gracious hosts were the best, as was watching a working family farm in action. Oh, and the dairy products! It was worth every extra penny to go through two glass half gallons of fresh milk and the same of yogurt, rich yellow-yolked eggs from the chickens wandering around, fabulous ice cream sandwiches. We didn't even dent the meat freezer! Highly recommend for your artist retreat, your family reunion, or your couples getaway. We'll be back, for sure. Beautiful cottage. Private winter getaway with lovely views. Looking forward to visiting again! A group of my friends and I rented the Toddy Pond Farm Cottage to celebrate another friends birthday and decided to extend our stay through New Year's Eve. All 8 of us enjoyed ourselves immensely. The cottage is beautiful and very well taken care of. Greg was a spectacular host and was extremely patient in putting up with a paranoid me as I obsessively checked the weather every few hours in the days leading up to our trip. A lengthy snowstorm was predicted for the day of our anticipated arrival and in a last minute change of plans, he allowed us to extend our reservation and made sure the cottage would be ready to go an entire day early for our group. We arrived very late at night (as we were coming last minute from almost 4 hours away in Massachusetts) to find that the outside lights had been left on as well as the heat turned up. Very cozy. We instantly felt welcome and made ourselves right at home. The next morning we woke up to an exquisite view of an incredible farm blanketed in snow, surrounded by gorgeous trees and a beautiful view of the pond. Greg was on top of the plowing of the cottage driveway and was very responsive and helpful the entire time we were there (he even hand delivered a package to us that we had delivered to the farm from Amazon). All in all the entire stay was perfect. Still sad that it's already come and gone! We are really happy you all decided to come visit the farm and are very glad you had enjoyed your stay. We do not have many winter guests, despite it being so beautiful and peaceful here, so it was especially nice that you all were able to enjoy the snow and the cozy cottage. And no problem at all adjusting your stay. Just glad it worked out and everyone got here safely before the storm. Thank you for being great guests, and for taking such good care of the cottage. 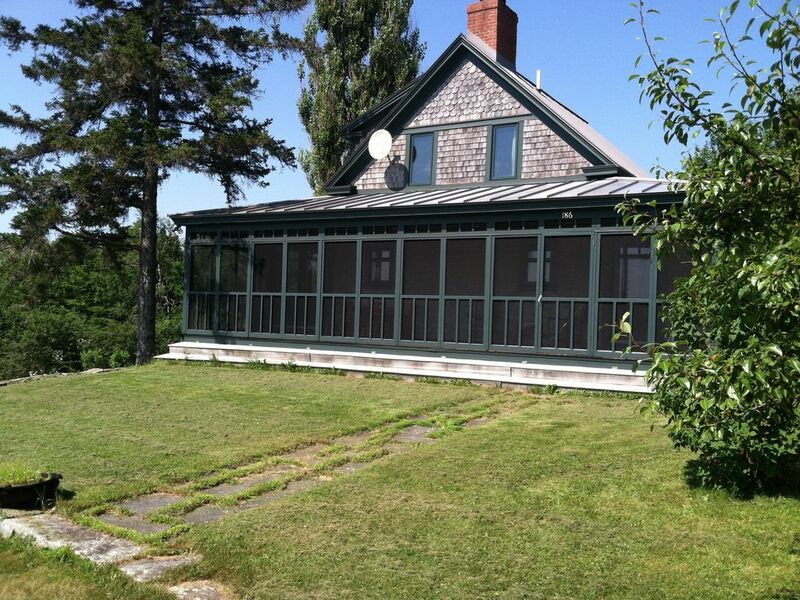 Toddy Pond Farm Cottage is quaint, spacious, and clean. With cows grazing in nearby fields and spectacular views of the pond and mountains beyond, the place is quite magical. The owners are clearly stewards of the earth as evidenced by the various organic, biodegradable products they have on hand. Highly recommend!!! Il cottage Toddy Pond Farm è situato su un caseificio di lavoro nella piccola cittadina di Monroe, a soli 12 miglia al di fuori di Belfast. Questo ambiente unico offre il meglio dei due mondi - totale privacy, pace e tranquillità in azienda 500+ acri con tutte le comodità di una piccola città di mare solo a breve distanza. L'azienda offre sentieri e accesso privato alla Toddy laghetto per la pesca, il nuoto e canottaggio e Belfast offre una varietà di attività e ristoranti oltre a numerosi eventi durante tutto l'anno. Non dimenticate di visitare il negozio Toddy Pond Farm per gustare formaggi, yogurt, gelati e una varietà di altri prodotti cascina fatto proprio qui. E mentre a Belfast, non dimenticate di visitare tutte le gallerie d'arte meravigliose o fare una passeggiata sulla passeggiata porto recentemente completato. Se siete alla ricerca di aragosta - Young Lobster Pound è una scommessa sicura. Se un pasto più raffinato è quello che stai cercando, procedere con la prenotazione al The Gothic ... le loro delizie culinarie non sono da perdere.